LONDON — A Conservative MP has been recorded describing the prospect of UK leaving the EU without a deal as a “real n*****r in the woodpile” at an event in London. 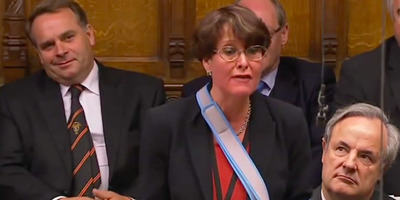 Anne Marie Morris, Tory MP for Newton Abbot in Devon since 2010, made the remark while talking on a panel of eurosceptic MPs. Morris made the remark while discussing how Brexit will impact financial services but fellow panellists Conservative MPs John Redwood and Bill Cash made no reaction, the Huffington Post reports. Morris said: “Now I’m sure there will be many people who’ll challenge that, but my response and my request is look at the detail, it isn’t all doom and gloom. A Conservative Party spokesperson said today that the language was “completely unacceptable” and the party is urgently investigating.